The NHL trade deadline passed without the Dallas Stars making a push to acquire secondary scoring options. For a brief few days, the Stars sat in third place in the Central Division. After losing three of their last four games, they’ve dropped back to the No. 1 Wild Card slot in the Western Conference. 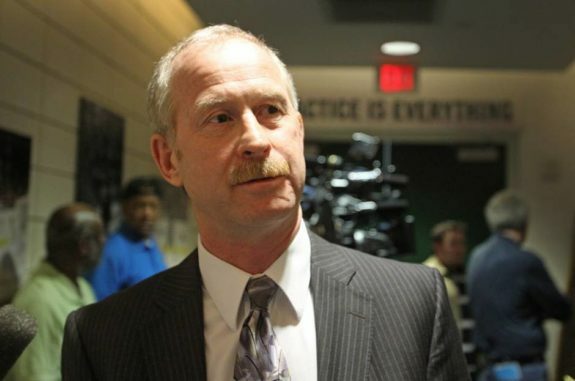 With other teams in the hunt like the San Jose Sharks making moves to deepen their scoring, Dallas general manager Jim Nill once again sat idle at the deadline. The Minnesota Wild, who Dallas plays twice in the season’s final five games, are three points clear of the Stars in the Central. Dallas is one point ahead of the Anaheim Ducks and two points in front of its division rival, the St. Louis Blues. There are many teams vying for two Wild Card positions as the NHL enters the final fourth of its season. Dallas had a chance to bolster its odds by shopping for a reliable offensive threat but elected to ride with its current roster. Still, the Stars have a reasonable shot at surpassing the Wild for third in the Central even without making a deadline deal. To do so, the players who have been around all season will have to rectify their recent inadequacies. 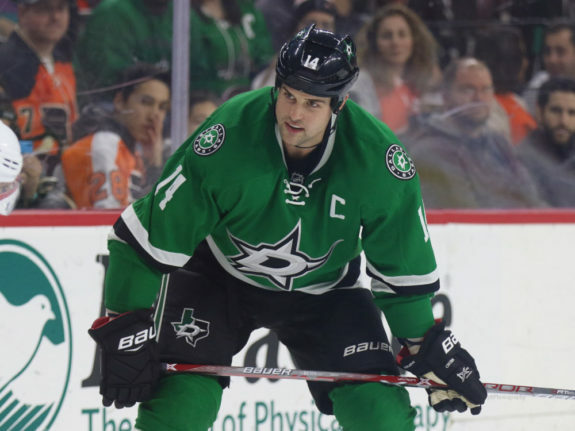 Stars captain Jamie Benn has one goal in the entire month of February. That tally came on Feb. 3 in a 6-1 home win over the Wild. He has six assists this month, half of which came in Dallas’ 4-3 shootout win over the Pittsburgh Penguins on Feb. 9. The Stars’ top line of Benn, Tyler Seguin and Alexander Radulov has carried the team for much of the season, but Benn’s noticeable on-ice woes have caused head coach Ken Hitchcock to reshuffle his lines. He moved Seguin to the second line with wingers Remi Elie and Mattias Janmark. Benn has moved from the wing to center with Devin Shore and Radulov. The hope was that moving Benn to center would free the former Art Ross Trophy winner up and allow him more opportunities to produce offensively. That hasn’t been the case through three-and-a-half games of the experiment. The switch occurred midway through the Stars’ 5-2 loss to the San Jose Sharks on Feb. 18. Hitchcock stuck with his changes two nights later in Anaheim, but Dallas failed to find the twine in a 2-0 defeat. Twenty-four hours later, the rearrangements were proving to be ineffective yet again until late in the third period against the Los Angeles Kings. Seguin, still centering Elie and Janmark, won a faceoff cleanly in the offensive zone and positioned himself in front of Kings netminder Jonathan Quick. Defenseman Greg Pateryn fired a wrister from the point and found Seguin’s stick for a 1-0 lead. Radulov added an empty-netter later in the frame, but Benn failed to register a point. Hitchcock reunited the trio during Saturday’s loss to the Winnipeg Jets. Though Dallas fell flat in the second period, allowing five straight Winnipeg goals, the Stars found consolation in their top line’s offensive performance. Radulov and Seguin recorded a goal each, and Benn finally returned to the score sheet with an assist on the latter’s goal. While Radulov has been a spark plug for the Stars for much of the season, he has been almost as cold as Benn during February. He had just one goal all month before his empty-netter in L.A. Before that, he logged zero points in four straight games. Seguin has been the only constant supplier of offense in recent weeks, but even he hit the same stretch of pointless games as Radulov. He picked it up with three points in Dallas’ last two matchups, but none of the Stars’ big three can continue to slump if they have serious playoff aspirations. That starts with Benn, who time and time again shoulders the blame for the Stars’ lack of offensive production and insists that the leaders of the team need to be better on a nightly basis. Fans in Dallas have begun to clamor for their captain to take his own advice. Dallas has four players with 50-plus points on its roster. One of them, of course, is a defenseman — John Klingberg. After Radulov (56), Seguin (54), Benn (54) and Klingberg (54), a 20-plus point gap looms until you find the Stars’ next leading scorer: Mattias Janmark (30). Every team ahead of Dallas in the Central Division possesses far more depth scoring than the Stars. Nashville has eight players with 30-plus points, Winnipeg has nine and Minnesota has seven.The Stars barely have five. Too often, Hitchcock relies on Benn, Seguin or Radulov to carry his club. While that trio has them in playoff position now, it’s too inconsistent of a formula to produce wins down the stretch. Benn can’t find the back of the net, and when his linemates join him, it gets ugly for the Stars. Dallas has been outscored 19-9 in its last six games, four of which the team lost. The Stars have fallen to 15th in the league in scoring at 2.9 goals per game. As the adage goes, it’s a 3-2 league. When a team can’t score three goals per game, it will end up squandering more games than it would like. The power play percentage has fallen alongside the total goal output. The Stars stand at just 19.1 percent with an extra man. That puts Dallas at 21st in the league. A lack of depth scoring has plagued that figure, too. Benn, Seguin and Radulov have 21 of the Stars’ 36 power play goals this season. Yes, they’re all guaranteed to see the ice during every man advantage, but the Stars’ role players simply aren’t carrying enough weight to lift Dallas to the wins it needs to persist in a congested conference. 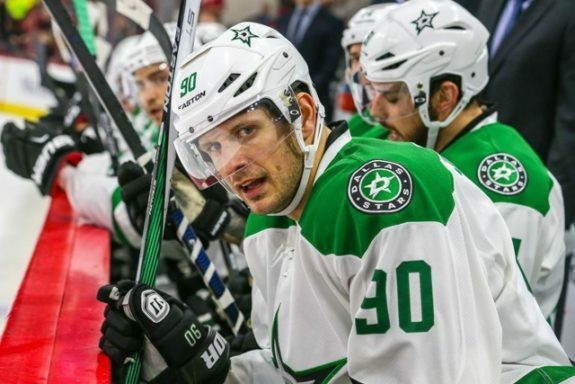 Jason Spezza has shown all the signs of aging and has hampered the Stars’ offense because of it. The 34-year-old scored 33 goals for Dallas two seasons ago but has since regressed mightily, tallying a mere seven this year to go along with 17 assists. He is no longer one of the Stars’ top six forwards, a decline many did not foresee to be this rapid. Of the Stars’ four every game centers, he logs the least amount of ice time. To Spezza’s credit, he’s played in every game except for one this year. That’s much more than Martin Hanzal can say. Hanzal was expected to compete for a top-six forward role this season but has only played in 38 games due to a bevy of injuries. Hanzal’s latest ailment came last week against the Ducks. 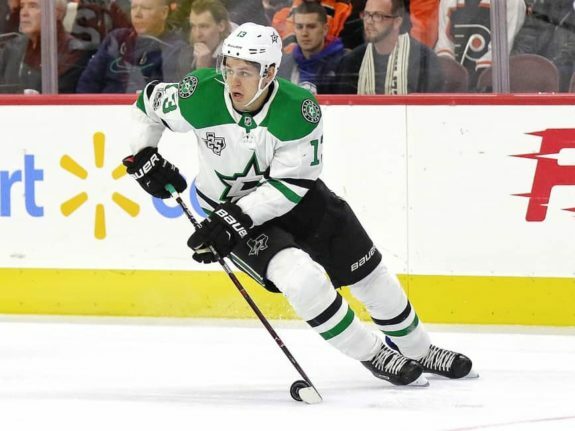 The 31-year-old only has five goals and five assists and is a wearisome minus-14 in his first season with the Stars. Spezza and Hanzal have clashed with age and injury, respectively, this year. But even the Stars’ younger players have grappled with mediocrity for unknown reasons. Devin Shore has identical offensive statistics (7 goals, 17 assists) as Spezza. The 23-year-old started the season with a 19-game goal drought and has been inconsistent ever since then. His plus/minus of minus-22 marks the worst figure on the entire team. Radek Faksa has progressed slowly himself. At 24, the Stars expected Faksa to have a breakout season. And while his next goal sets a new career high, his offense has come in very sparse increments. He hasn’t scored a goal since Jan. 20 and has just two points in his last 14 games. Brett Ritchie, 24, has almost made the leap from full-time AHLer to full-time NHLer this season, but he only has four goals and six assists in 53 games to show for it. Ritchie’s former teammates on the Texas Stars — Gemel Smith and Remi Elie — have also seen considerable ice time in Dallas this season but only have a 21 combined points. For the Stars to shine, they need scoring from the bottom three lines — especially with Benn being in an extended slump of his own.